We believe that all people should have equal opportunity to live a healthy and full life, regardless of ability. We continue to fund organizations that assist our neighbors to live healthier lives and reach their full potential, regardless of ability. It was a customer inquiry about a handicapped specialty cart that prompted Store Director Bill Domerchie to reach out to Grayslake #3464 associates. They in turn held several fundraisers and this month “Caroline’s Cart” arrived for customer use. “I could not be more proud of my store team for taking on this need and making it happen,” said Domerchie. 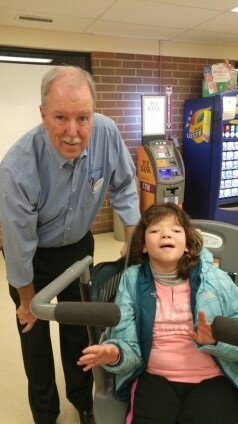 Domerchie is pictured with 11 year old Isabella, who is benefitting from the cart.